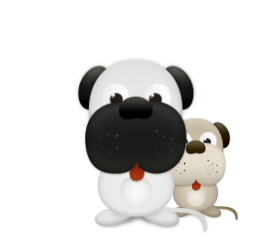 Our Work, Dog rescue and re homing in Sussex, Surrey, Cambridgshire, Bedfordshire, Huntingdonshire - www.desperategreekiesdogrescue.com, Dog rescue. 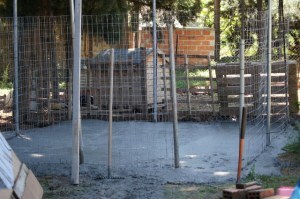 Concreting 2 areas to make such a difference from the smelly, mucky ground at two entrances into pens, washing away dirty water should be more efficient now. 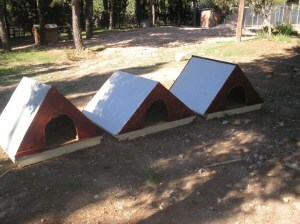 Below are the fabulous new kennels that we have managed to source funds for, a good size they are being handmade in Greece by a man who is clever with wood using Marine ply for strength, white floor paint to reflect the sun and for toughness and metal all around each entrance to protect from teeth and chains. 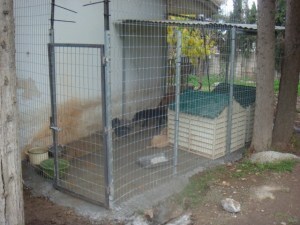 The kennels were delivered whilst I was at the shelter in October 2015 and each chained dog now has one of these kennels in place, coupled with the concrete base we put down for them to stand on it has made such a difference. Compared to the above picture I'm sure you will agree at least the poor dogs can at least get out of the weather.. 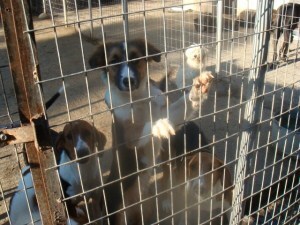 Visits to the shelter are never a holiday, there is always lots of work to be done to make life better for the dogs. We don't like the way the dogs are kept but with so many and hardly any resources or man power we just try to make things a bit better. 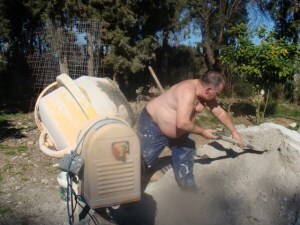 This time Dennis was lucky to have help from the UK for a few days. 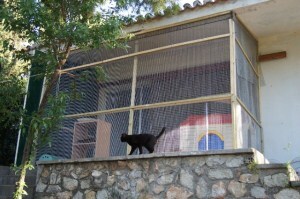 A cat pen so cats that need to be in can get some fresh air and sunshine in safety. 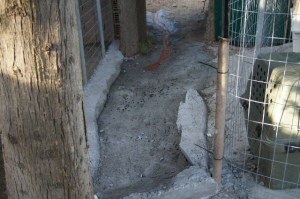 A gully to take rain water away from an existing pen instead of flooding in and underneath this pen. We improvised with some old roof tiles! A new roof on an existing pen. 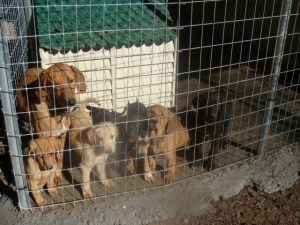 A make shift pen so 2 puppies that were kept in a cage (whilst it was decided were they could be put ) could get out in the fresh air and stretch there legs. A new pen, the existing make shift pen was just a mud bath. This work was done with the barest amount of materials and nothing was wasted! 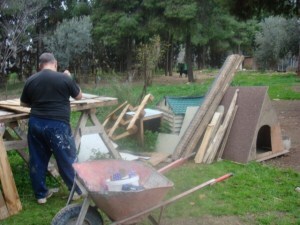 we built lots of dog houses, as some of the dogs have no shelter from the sun or rain. 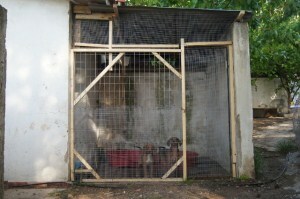 We made a pen from an existing hole in a wall in desperation when yet another dog needed shelter. 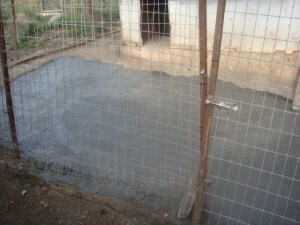 We concreted the floors so they could be cleaned more easily, collected and mended broken kennels, fixed new wire. 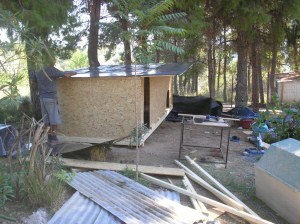 Denis worked so hard to build these very much needed houses.. 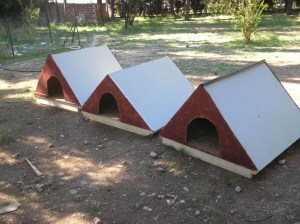 The cats love these little wigwams we made, we brought the material from the UK with us, its waterproof. 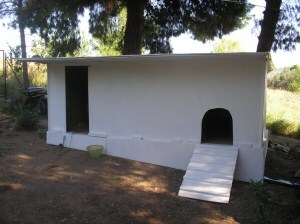 We always need funds & volunteers to help us maintain the shelter for the dogs & cats and build more homes for them. Please contact us if you can help. treat and such a relief for him, it was the first time he had left his concrete pen! 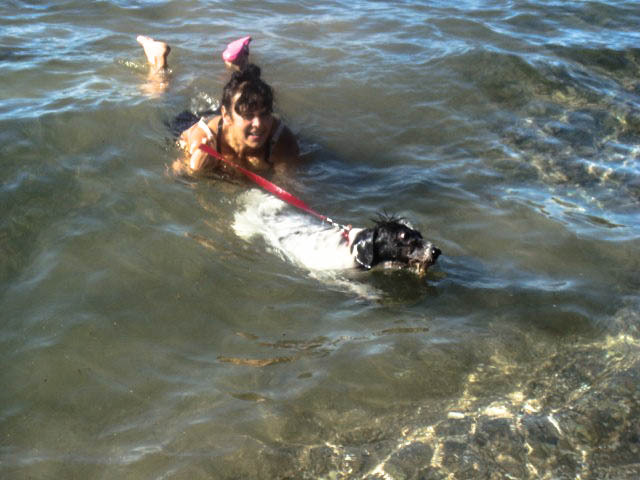 Beano enjoying a swim with Michele on a hot day in the cool ocean in Greece.